I've been dying to try this technique and just got around to it recently for my SIL's bday. You can find the Crimped Envelope Tutorial here. My parents are going to see them today and this is the perfect card for hand delivery. It was a blast to make. I am really loving the spongy inked look. 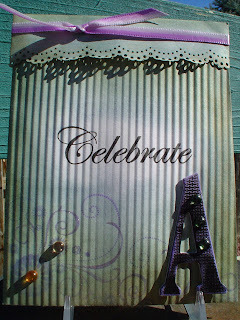 Oh and the Celebrate stamp was a free stamp I got from That's Jazzy Stamp Dreams. It's a fabulous polymer stamp that inks super clear and crisp. Thanks Sheila, I love it! And that's my new MS lacy border punch I got after feeling down from my dentist appointment on Friday, LOL. Yes, retail therapy is BIG in my life. ;) I also got some glue dots and white CS so I can finally catch up on all my image swaps!!! And here is the card inside. 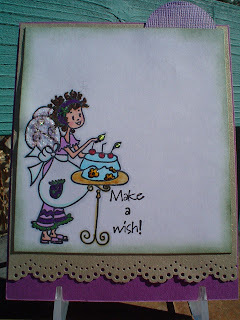 I love Bettina Buttercream, so cute and so fun to color. I just love all her curls. I haven't tried this yet! yours came out great...tfs!!! I've been dying to try this also..yours came out wonderfully! I love how you sponged it...what a great job you did! This is fabulous! inside and out! Very pretty. This is really beautiful - I love the outside and the inside. Thanks for visiting my blog! Lovely, lovely, lovely! I want to try this one! Beautiful Carisa! Sponging is also a firm favourite of mine! I sponge lots!!!!! So cute! I love how you used the lace border punch. Cute image for the insert! I received one of these once & it was so cute, I meant to try to make one but as always forgot all about it. Now I have an actual list of things to try, lol, & I'm adding this to it!! Yours is too cute!! And hooray for retail therapy!! Cute image on the inside! Great job on this card. I just got that border punch too and cannot wait to use it. This is fabulous, Carisa!! What a great card....I'm going right to that tutorial! I need to try this technique. Your card looks great. The top card of the little girl with the shamrock reminds me of my little girl. Enjoy the rest of your weekend. So cute! I have to try one of these cards. That image is so adorable. You did an amazing job! This is a really fabulous card. I love the colors and details.